For the 2017-2018 academic year, three women served Delta Zeta as Colony Consultants – ensuring the recruitment of new members and providing guidance to recolonization efforts at our Omega colony at the University of Oregon and the Gamma Beta Chapter at the University of Connecticut. These consultants served as mentors and confidants and educated our newest Delta Zetas on what Delta Zeta is all about. Ally Tack (Beta Kappa – Iowa State University) applied to be a consultant because she wanted to help inspire women to join an organization that will mold and change them for the better, like Delta Zeta did for her. “I had dreamed of the opportunity after meeting several consultants throughout my undergraduate career and seeing the same passion for Delta Zeta and empowering women that I felt I also had within me,” Ally said. Megan Togher (Delta Beta – University of Tampa), echoed Ally’s sentiments. “I wanted to make an impact on women in Delta Zeta and to give back to an organization that had given so much to me,” she said. 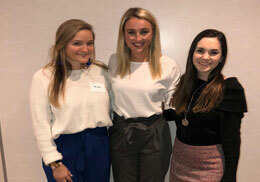 While our consultants’ primary role is to help with the overall establishment of new chapters, that is just the beginning of their work with the newest Delta Zeta chapters. Other roles like advisor, counselor, cheerleader, organizer and others not in the job description come their way as well. “You become everything that these women need to become successful and, though it can take everything out of you, it adds so much meaning and growth to your life,” Megan said. Ally says she will miss seeing the collegians every day, as she became invested in them as individuals. “I looked forward to hearing about how they did on an exam or a date they went on because I care so much about all of them. I am going to miss being a part of their lives on a consistent basis,” Ally said. Learning and educating became a two-way street for the consultants and the collegians, volunteers and administration they worked very closely with. Ally did not expect to build the relationships she did while working at the University of Oregon. Megan added that she will miss the friendships that she made as well, and celebrating the chapter’s successes as they grow and conquer challenges in the coming year. After finishing their term as consultants, Ally will continue her employment with Delta Zeta as a Director of Chapter Services. Megan will be teaching third grade beginning in August and Brooke Marcello (Sigma – Louisiana State University) will attend law school at Loyola University New Orleans. The consultant program is supported by the Delta Zeta Foundation. Your gifts ensure our Delta Zeta collegians receive the resources, programming and mentoring to ensure a quality Delta Zeta experience. We look forward to welcoming our newest group of consultants as they hit the road this fall and continue to support both the Omega Colony and the Gamma Beta Chapter!